John Ryan’s Cling, the second in a series of three exhibitions curated by Jim Ricks for this temporary/alternative exhibit venue, presented a lively group of monochrome paintings together with a visually arresting installation that occupied the studio building’s atrium. The paintings, which explored the physical properties of adhesion, texture, plasticity, and light, also proposed to keep – or at least postpone – the medium’s film forming properties from taking place. 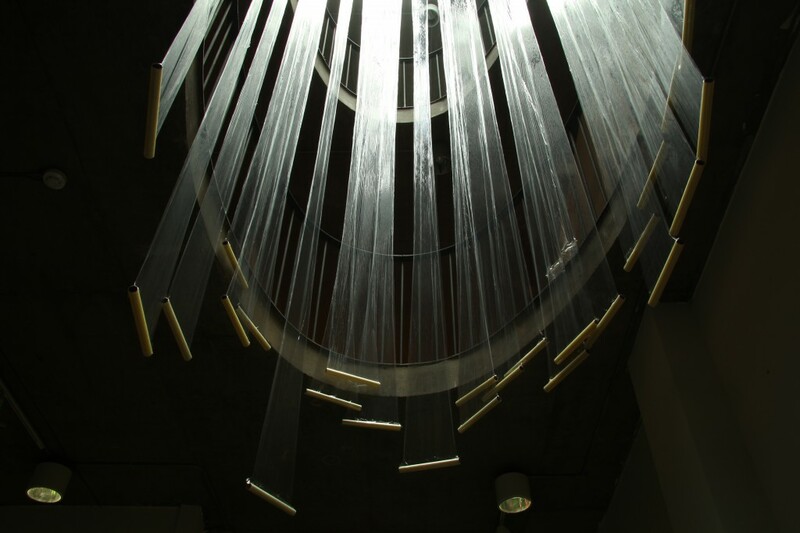 John Ryan: Cling, 2013, Photo: Kevin Gaffney; Image courtesy the artist. A self published zine ‘Things that Cling’, also forms part of the exhibition. The black-and-white reproductions in this booklet extend the contents of the gallery by providing illuminating detailed images and additional examples of Ryan’s work. But more importantly, the centrefold juxtaposes two short texts that clarify the artist’s point of view. The first text, a quote from Ian McKeever’s In Praise of Painting, speaks of the loss of light in the history of painting. Then, just beneath it, Ryan has added his own as truthful as it is humorous version in which he equates the history of painting with the loss of liquid: “A world of wet becomes a world of dry.” His aim in presentation was to counter this observation. Ryan has accomplished this in two distinct ways: by sandwiching what seem to be broad single brushstrokes between generous expanses of lightweight Mylar and by means of encapsulation. In the first or sandwiched group of paintings, the Mylar replaces both canvas and varnish, and the unpainted peripheral regions of this support/protective coating serve as tacking margin. The paint acts as adhesive, bonding the sheets of plastic and changing their character through the creation of dense variegated networks of wrinkles that permeate these areas of contact. Ryan has also introduced sculptural qualities in the way that he nails these works to the wall. 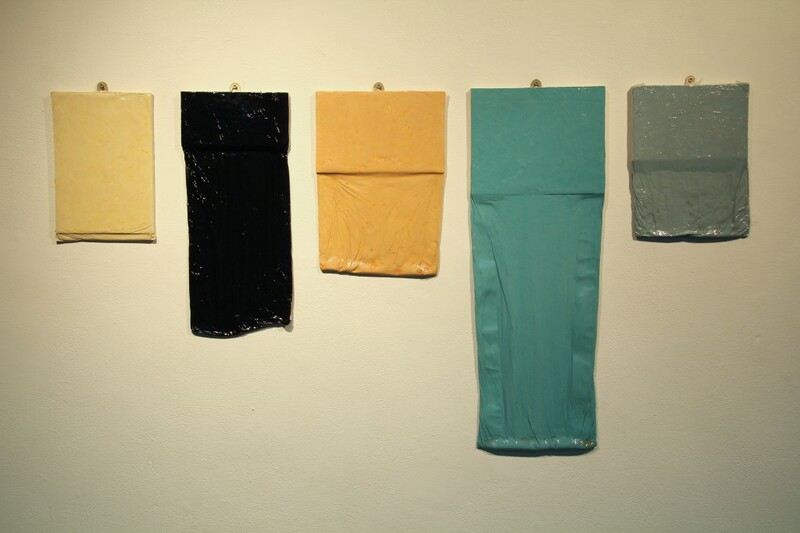 Portions of the oft crumpled Mylar have been stretched, gathered or torn, whereas others have been allowed to hang freely or fold back on themselves. The general structure of the second group of works contrasted dramatically with the first. Muted in tone, smaller in scale and involving greater quantities of paint; these works suggest a nightmarish occurrence reminiscent of Dali’s Persistence of Memory. Only here it is the medium itself that has been stretching – sliding, in fact, right off the surface of variously sized rectangular panels. The thick layers of material dangled like wattles and looked like they could have descended further if the artist had not bagged it in a clear plastic wrap. The paint’s wetness was readily apparent by way of its buttery consistency and the evidence of some separation of its constituents. Its alluring presence made it difficult not to touch the surfaces, but this would have destroyed the work, had it been allowed. The corporality conveyed by these pieces was quite unexpected and is rarely encountered in painting. Five of these works hung in a group, a configuration that proffered a discourse on colour, shape, proportion, and scale. The discerning placement of a sixth panel between two rectilinear wall recesses extended the conversation to the disparity between positive and negative spaces, as well as architecture and painting. The installation – an allied, paint-free work – consisted of multiple lengths of cling film. Suspended from the railing on the top floor of this four-storey building to a point just below the ground floor’s ceiling, the work articulated and animated the space and delighted the eyes by virtue of its propensity to change. From some perspectives the cling film was almost imperceptible; seeing it from the ground it resembled a tube clad in mirrored glass or highly polished metal that, because of the light that was reflected, obstructed vision. Shifts in daylight strengthened and diminished its appearance and air movement caused it to sway. 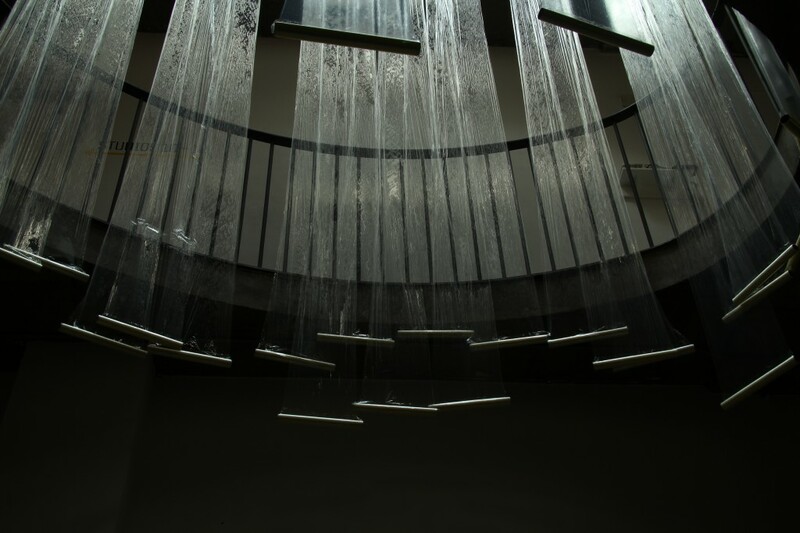 At times it looked like veils of water were cascading down through the space. Of course, Ryan had matter-of-factly left the paper cores of each roll attached to the end of each length of film. These ultra light weights reminded viewers of the everyday material out of which the work had been rendered. Cling, in essence, exuded veracity by being exactly about what the title says. Not only does it describe an action and a commercial product, it also involves the embracement of an idea. The artist’s interest in wetness also calls attention to paint’s appearance and its physical state. As far as paintings go, a general consensus would surmise that such a state is both formative and impractical, but Ryan does not shy away from proposing alternatives. He acknowledges such challenges and develops strategies for bringing his ideas to fruition. People have often been dissatisfied with the look of paintings – bemoaned by their lack of freshness when dry – and applied varnish to re-saturate colours. Ryan is not just substituting plastic film for varnish, he is taking things further. His work references easel paintings and moves away from the conventions associated with their production. He strives to maintain the medium’s freshness by containing it, which enables viewers to reacquaint themselves with its original condition. In this raw state, the paintings possess an immediacy that is bracing and form a fascinating subject for anyone interested in paint. John Gayer studied at the Ontario College of Art and Design, the Banff Centre, the University of Toronto, and Queen’s University in Canada. His writing has appeared in Art Papers, Canadian Art, Circa, Sculpture Magazine, the Visual Artists’ News Sheet, and other publications. The title applies to all works in the exhibition.